Relieves heartburn associated with acid indigestion and sour stomach. Prevents heartburn associated with acid indigestion and sour stomach brought on by eating or drinking certain food and beverages. 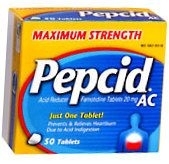 1 tablet relieves heartburn due to acid indigestion (read Package Insert before use). Adults and children 12 years and over: to relieve symptoms, swallow 1 tablet with a glass of water. Do not chew. To prevent symptoms, swallow 1 tablet with a glass of water at any time from 10 to 60 minutes before eating food or drinking beverages that cause heartburn. Do not use more than 2 tablets in 24 hours. Children under 12 years: ask a doctor. Read the directions and warnings before use. Keep the carton and package insert. They contain important information. Allergy alert: Do not use if you are allergic to famotidine or other acid reducers. Do not use: if you have trouble or pain swallowing food, vomiting with blood, or bloody or black stools. These may be signs of a serious condition. See your doctor; if you have kidney disease, except under the advice and supervision of a doctor; with other acid reducers. Ask a doctor before use if you have: had heartburn over 3 months. This may be a sign of a more serious condition; heartburn with lightheadedness, sweating or dizziness; chest pain or shoulder pain with shortness of breath; sweating; pain spreading to arms, neck or shoulders; or lightheadedness; frequent chest pain; frequent wheezing, particularly with heartburn; unexplained weight loss; nausea or vomiting; stomach pain. Stop use and ask a doctor if: your heartburn continues or worsens; you need to take this product for more than 14 days. If pregnant or breast-feeding, ask a health professional before use. Keep out of reach of children. In case of overdose, get medical help or contact a Poison Control Center right away.